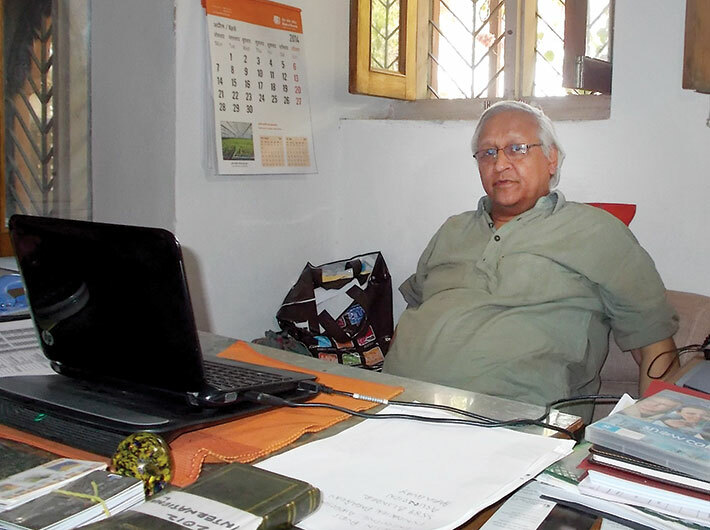 "This is just showing that an alternative is possible"
Sanjit 'Bunker' Roy is the founder of Barefoot College. In 2010, he was selected by the Time magazine as one of the 100 most influential people in the world for his work with illiterate and semi- literate rural women in developing countries. He spoke to Shreerupa Mitra-Jha. You gave up a privileged life to work in a particularly underdeveloped part of the country. So what happened? The Bihar famine happened. Jayaprakash Narayan called the youth of the country to work in Bihar. It was the first time I went to a village in 1965 and saw the other part of India; the India that is not spoken about, thought about, or felt about. I was shocked. I wanted to contribute. My mother did not like the idea though my wife Aruna [Roy] was a great support. She was in the Indian Administrative Service then. But she quit in 1974 and joined me. The man who taught me to drill (Meghraj) was from this very small village called Tilonia. I was an unskilled labourer in Ajmer district for five years drilling wells for drinking water after my Bihar exposure. I came to Tilonia with him. I had no idea that I was to stay for 40 years here. Meghraj helped me find a place. I used my St. Stephen’s connections (Mohan Mukherji and VC Pande) to lease a TB sanatorium-turned-state warehouse for Re 1 per year. That was our Barefoot campus for 30 years till the government suddenly realised that we were exploiting them. [Laughs]. It was quite a drama. Now a large portion of the campus has been given to the railways. We shifted to the new campus in 1986. Anyway, I started with water. The problem is always water; digging wells, finding water sources etc. I didn’t mobilise people. I had no money. The Tata Trust gave me Rs. 20,000. Ram Baba, a distinguished man, was the first to join me. Ram Baba was from the so-called lower caste. He said to me, “Lots of people will come to you but they won’t drink water if I serve them. You just see how they react.” I told him that it did not matter. He was a great teacher and I learnt a lot from him. And of course, Meghraj was there. Both are dead now but they were a great support when we started Tilonia. It must have been a very difficult journey. There was a priest who lived on the hills. The villagers said he could divine the future, and I should go meet him. Though I don’t believe in such powers, I agreed. The priest told them that I won’t last long. That priest was my first stumbling block. Then most people thought I was a naxal because I was a Bengali. [Laughs.] Then the sub-divisional officer came to know we were from the same college (St. Stephens) and he spread the word, “that is my man, don’t touch him.” So it is not knowhow but ‘know who’ that makes all the difference. That time I believed we should get professionals from outside. Then in 1974-76, we had a crisis. After that Aruna and I felt that we should build the people from inside regardless of whether they have degrees or not, rather than depending on people from outside. That is how Barefoot started. That is why we called it the Barefoot College. There were these people who incidentally did not go to school or college but were extraordinary in their own way. Sadly they were already doomed in the eyes of the world because they were not literate. What message do you want to send with Barefoot? All the people you see here in Tilonia have stayed for 30 years or more. We are trying to send a message that there is a difference between literacy and education. Just because someone is illiterate does not mean he/she is uneducated. There are millions of people who are not literate, they have something to contribute, don’t write them off. They have the capacity to identify the problem and find the solution. The barefoot model has been bottom-up and no formal education. Through this journey we had to do a lot of un-learning and re-learning. You know the quotation from Toffler, “The illiterate of the 21st century will not be someone who cannot read and write but someone who can’t learn, unlearn and re-learn.” I have no hope from the academics and elites of this country. I have seen reality. The real hope is with these poor people; this is where the real hope of India lies. The fact that they have nothing, yet they are contributing, the fact that they have no technical skills but they have tremendous wisdom and skills combined. Look at their generosity, tolerance, compassion here. People go to the best educational institutions yet they are more often than not morally and spiritually bankrupt. Did you at any point regret waging such a tough battle? You do your best work when you are insecure. You don’t know where your next meal is coming from and where your next salary is coming from. You have to burn your boats behind. I never went back. Even in the worst possible moments a small voice would say “stick it out.” There is no choice. People are looking at you and you are always under scrutiny; how you are responding to situations, crises etc. Sometimes when it gets too much, you have to distance yourself. (There is) absolutely no time for regrets. How is the organisation structured and how do you ensure its sustainability? This organisation is very loosely structured. We do not believe in a 9-5 working day. It is important for your creativity to have a structure but there should not be a hierarchy. It is important to practise equality, we cannot have a huge discrepancy in salaries so the highest salary is maximum of only twice as much as the lowest salary. Moreover, we don’t sign contracts. Everybody is a volunteer and is free to stay and go when they want to. A piece of paper doesn’t show anything; it is based on trust. We are defying all rules, yet people seem to be part of a larger extended family. We don’t believe in caste or class hierarchy and we live it, follow it and learn it. We are around 400 volunteers reaching at least 1,00,000 people across 500 square miles through interventions in water, education, health etc. We make our model sustainable only by respecting the resources we use. The Barefoot campus is fully run by solar energy and every drop of rainwater is collected from roofs in a 4,00,000 litre underground waterproof tank. We are a charitable organisation, so we cannot make money. Every year we have to show a loss in our books. That is the law of the country. What Bhagwat Nandan and Laxman Singh provide in solar lighting all over the world is generating enough income to run all other activities in the organisation. We will also be generating some income from the handicrafts section. Our salary structure is so low, it is absurd, but people have been working here for 40 years. So what makes this place tick? I have no idea what makes this organisation tick. Everybody has a unique story for what makes them stay here. So I can’t speak for them. In my lifetime I want to see this organisation fully run by them. These are people who have grown up with me. It is not a one-man show and cannot be a one-man show. You cannot put someone on the pedestal. That is why it is difficult for outsiders to come in and adjust to this life. We have to go international now. We have a very powerful message for the world outside, which is anti-World Bank, anti-UN, anti-international donor. It is a message that we have applied and tested on the ground. We are already in 35 of the 47 least developed countries identified by the UNDP; we have 604 women solar engineers trained from 64 countries with funding from GoI and 68 grassroot organisations assisting in spreading the Barefoot movement; that’s hell of an impact. We trained an illiterate woman from Afghanistan in 2007. She went back and electrified the whole village. It was the first solar-electrified village of Afghanistan. After that she sat with the men. When the men objected, she said, “Today I am not a woman, I am an engineer.” What guts! The problem with international donors is that they don’t mind failure. Not one project of World Bank survives and nobody cares. Jeffery Sachs spends 2.5 million in one village and it is a disaster. If you give me 2.5 million, I will solar-electrify 10,000 households and train 100 grandmothers in 22 countries. The urbanized world cannot believe that someone who has not gone to school can become an engineer. This is just showing that an alternative is possible. We are saying that there is a different way, don’t be in a hurry, see the impact and then let’s work backwards from there. It is challenging but we have a contrast to offer. No, not really. As long as it does not go to your head, it is fine. And with a wife like Aruna my feet will always be rooted to the ground.